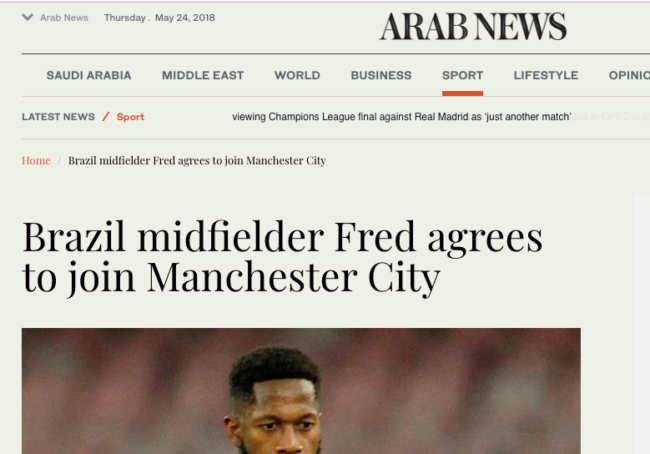 More transfer balls from journalism’s twilight zone of fake news, guesswork and clickbait as the BBC says Manchester United are “close to signing Shakhtar Donetsk midfielder Fred”. United “hope to complete a deal for the Brazil international next week”. The BBC links to a story in the Manchester Evening News. Over there, readers are told that Fred “could complete his transfer to Old Trafford from Shakhtar next month”. Well, he could. And then again, he might not. But if it’s facts you want, the paper tells us that Fred and the rest of the Brazil squad are “travelling to Europe next week for the national team’s friendly with Croatia at Liverpool’s Anfield stadium”. So…? Well, Fred “could finalise his move to United during his stay in the north-west of England. Anfield is only 29 miles away from United’s Carrington training complex”. It’s also not that far from where Manchester City trains. It’s even closer to Liverpool. Manchester City have agreed a deal to sign Fred in the summer transfer market, according to a report. According to The Mirror a £50m deal has been provisionally agreed with Shakhtar Donetsk for the end of the season. Pep Guardiola will not have to wait long to get his hands on the former Internacional star… The 24-year-old has also been linked with Manchester United, but unlike Alexis Sanchez, the Blues appear set to win out in this transfer battle. There was much speculation throughout January that Fred would be moving to the Premier League and now his fate looks to be sealed as league leaders City have agreed a £44.5m deal, according to Goal. Pep Guardiola is a known admirer of the 24-year-old, however, and will win the race to secure his signature in a deal worth £35million, according to Arab News. It is claimed the move is now a matter of when rather than if. Manchester United also explored the possibility of bringing Fred to England in the current transfer window as Jose Mourinho sought to restructure a midfield that has been persistently weakened by player unavailability this season. Unlike their successful head-to-head battle to sign Alexis Sanchez from Arsenal, however, United have accepted that the versatile midfielder is destined for their rivals. Fred to PSG it is, then. 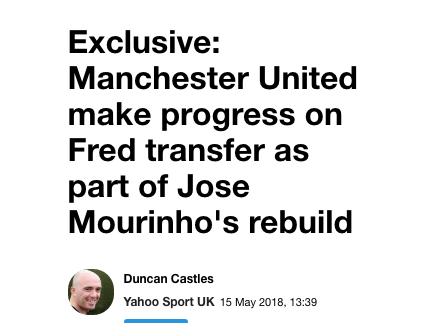 PS: Why do United want Fred? “Manchester United manager Jose Mourinho wants to sign Brazilian midfielder Fred from Shakhtar Donetsk as a replacement for Paul Pogba” – BBC, April 18, 2018.